The promotion held a special Seasonal press conference which took place earlier today (Friday, April 12, 2019) at noon ET from inside the State Farm Arena in Atlanta, Georgia after the UFC 236 ceremonial weigh-ins. The purpose of this presser is to hype out the upcoming main and co-main events. UFC head honcho Dana White and several fighters who’re competing at those events participated. 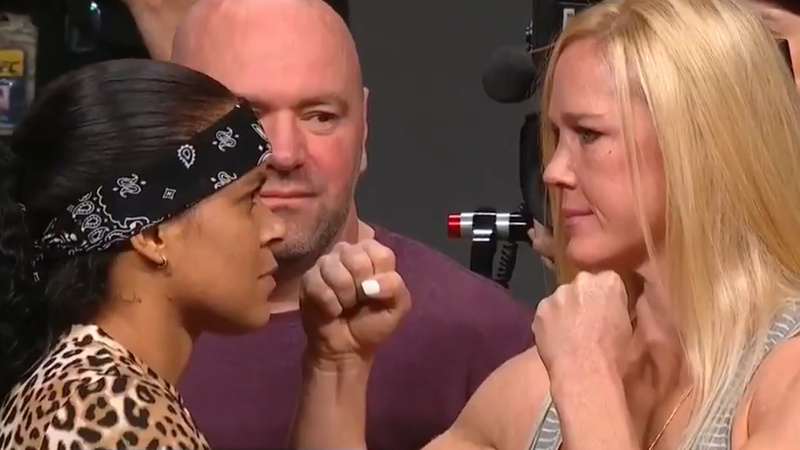 At today’s presser, the women’s UFC bantamweight and featherweight champion Amanda Nunes and former 135-pound champion Holly Holm took a front stage. Holm will challenge Nunes for bantamweight title in the co-main event of UFC 239. Fight fans also expected Jon Jones and Thiago Santos to come up front, but ‘Bones’ didn’t show-up due to a mystery illness. ‘Lioness’ and ‘Preachers Daughter’ came face to face during their pre-fight staredown as well as Francis Ngannou vs. Junior dos Santos, Henry Cejudo vs. Marlon Moraes, Rose Namajunas vs. Jessica Andrade, Ronaldo Souza vs. Jack Hermansson, Tyron Woodley vs. Robbie Lawler, Alexander Gustafsson vs. Anthony Smith, Raphael dos Anjos vs. Kevin Lee also faces off. 🏆 @RoseNamajunas 🆚 🇧🇷 @JessicaMMAPro LIVE from Rio. 'The 🐊' vs 'The 🃏' @JacareMMA vs @JackTheJokerMMA meet at #UFCFtLauderdale! Home turf to defend as @AlexTheMauler welcomes @LionheartASmith to Sweden! A tough intro to the WW division! @MotownPhenom moves up to take on @RdosAnjosMMA at #UFCRochester!